A couple of weeks ago we had invited my wife's friend and her family over for lunch. We hadn't seen them in a while, it was a great opportunity to catch up with them and for my daughter to play with her two kids who are around the same age. I whipped up a few dishes that day, all turning out well, and this was one of them. Instead of just roasting the cauliflower in the oven with olive oil, salt and pepper, and topping with cheese like I normally do when kids are around, I decided to play around a little bit since I had prepared something else for the kids. This dish is very basic and easy to prepare, and the cilantro adds great taste to the final product. Pre heat the oven to 400 degrees. Clean the cauliflower, and cut into small pieces. Toss the cauliflower with 1 1/2 tbsp olive oil, salt and pepper for seasoning and transfer to a baking tray, laying them out flat. Bake for 15-20 minutes until the cauliflower is cooked, and nice and brown at the edges. In the meantime roast the whole garlic on a pan for a couple of minutes with a drop of oil in order to just take away the rawness a bit. In a small blender, take the cilantro (coriander) leaves, green chili, the roasted garlic, and water and blend into a paste. Cut the onion into thin long strips. On a pan, pour 1/2 tbsp of oil, add the onions and roast them at low to medium heat until caramelized. 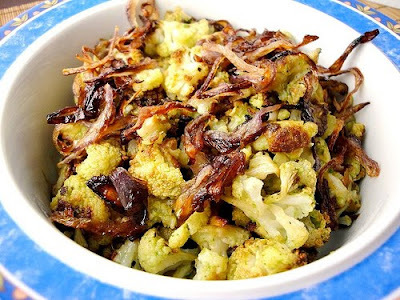 Once the cauliflower is done, in a serving bowl mix it well with the cilantro paste, and garnish on top with the caramelized roasted onion.